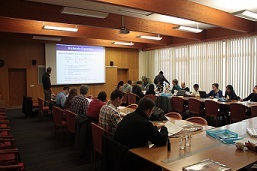 The short course begins with a detailed conceptual and mathematical description of water flow and solute transport processes in the vadose zone and groundwater, followed by a brief overview of numerical techniques for solving the governing flow and transport equations. Special attention is given to the highly nonlinear nature of the governing flow equations. Alternative methods for describing and estimating the hydraulic functions of unsaturated porous media are also given. 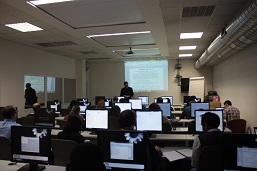 Hands-on computer sessions will provide participants an opportunity to become familiar with the windows-based HYDRUS-1D and HYDRUS (2D/3D) computer software packages, including several additional modules, such as ROSETTA, HP1, UNSATCHEM, and/or the Wetlands module. Emphasis will be on preparation of input data for a variety of one- and multi-dimensional applications such as flow and transport into and through the vadose zone, infiltration from a subsurface source, and two-dimensional leachate migration through the unsaturated zone. Calibration will be discussed and demonstrated with several examples for both water flow and solute transport (using HYDRUS). Selected advanced HYDRUS topics will be covered during the second part of the course. New: Short course/Workshop participants will have an opportunity to present a poster (with a 5 min oral introduction) of their research in the afternoon of the third day. Dr. Jirka Šimůnek is a Professor of Hydrology with the Department of Environmental Sciences of the University of California. He received an M.S. in Civil Engineering from the Czech Technical University, Prague, Czech Republic, and a Ph.D. in Water Management from the Czech Academy of Sciences, Prague. His expertise is in numerical modeling of subsurface water flow and solute transport processes, equilibrium and nonequilibrium chemical transport, multicomponent major ion chemistry, field-scale spatial variability, and inverse procedures for estimating the hydraulic properties of unsaturated porous media. He has authored and coauthored over numerous peer-reviewed publications and book chapters, and several books. His numeric models are used by virtually all scientists, students, and practitioners modeling water flow, chemical movement, and heat transport through variably saturated soils and groundwater. Dr. Simunek is a recipient of the Soil Science Society of America’s Don and Betty Kirkham Soil Physics Award, is a Fellow of both SSSA and AGU, and is or was an associate editor of several journals including Vadose Zone Hydrology, Journal of Hydrology, and Water Resources Research. Dr. Radka Kodešová is a professor of Soil Science with the Department of Soil Science and Geology of the University of Life Sciences, Prague, Czech Republic. She received an M.S. in civil engineering and Ph.D. in irrigation and drainage from the Czech Technical University, Prague, Czech Republic. Her expertise is in numerical modeling of subsurface water flow and solute transport processes, inverse procedures for estimating the hydraulic properties of unsaturated porous media, field and laboratory experimental work, and soil structure analysis. Please complete the On-line Registration Form. Please, make the payment via a bank transfer. An invoice will be sent to participants after registration. If cancellations are made before February 28, 2016, the tuition fee will be fully refunded. Cancellations made after February 28, 2016, will be refunded for 75% of the tuition fee. Registration includes: course material, lunch, 2 daily coffee breaks, and a short course dinner on March 23 (likely with beer tasting in the university brewery). 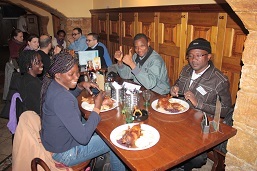 Each course participant has to arrange his/her own accommodation. Several hotels close to the Czech University of Life Sciences are listed here. There are hundreds of hotels in downtown Prague, which is about 30 minutes by public transportation from CULS. 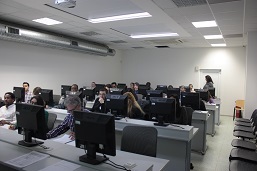 The HYDRUS short course and workshop will take place at the Czech University of Life Sciences in Prague-Suchdol. 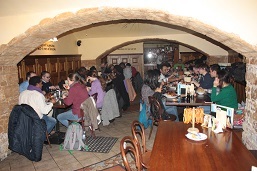 For travel to the university and recommended hotels from Prague-Ruzyne airport please Click Here. From Ruzyne airport take bus No. 119 to the bus and underground station Dejvicka (the last bus stop). Then take the either bus no. 107 or 147 to the required destinations as marked in the map. Please note that for the bus to stop in front of the Hotel Galaxie-Wienna you must push the STOP key close to the bus exit door. From Prague train stations please take underground to the station Dejvicka (the last station on the line A). Then take either bus no. 107 or No. 147 to the required destinations as marked in the map. Please note that for the bus to stop in front of Hotel Galaxie-Wienna you must push the STOP key close to the bus exit door. 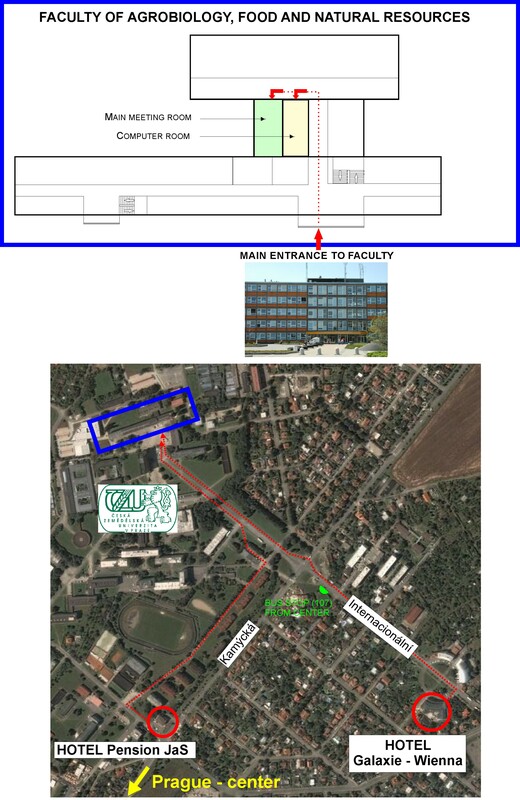 The main meeting room and the computer room are located close to the main entrance of the building of the Faculty of Agrobiology, Food and Natural Resources as shown on the map.